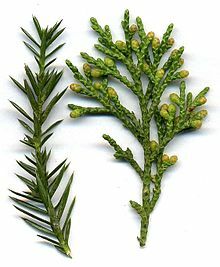 So, why is the juniper plant declining at such a rapid rate? Well a survey conducted in the north and west of Britain in two thousand and four to five showed that a major problem is the fact that in present-day populations, ratios between the sexes are unbalanced and without a proper mix of male and female, bushes don’t get pollinated. Also, the survey found that in a lot of these populations, the plants are the same age, so this means that bushes grow old and start to die at similar times ... leading to swift extinction of whole populations. 2 Its smoke is virtually , so juniper wood was used as fuel in illegal activities. 3 Oils from the plant were used to prevent spreading. 4 Nowadays, its berries are widely used to food and drink. 6 In current juniper populations, ratios of the are poor. 7 Many of the bushes in each group are of the same age so of whole populations is rapid. 8 Plantlife is trialling novel techniques across areas of England. 9 One measure is to introduce for seedlings. 10 A further step is to plant from healthy bushes.